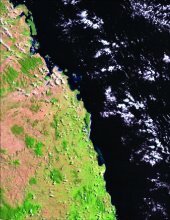 We examined five images dated from 1999 - 2000 and classified all areas within 5 km of the coastline as forest or non-forest. 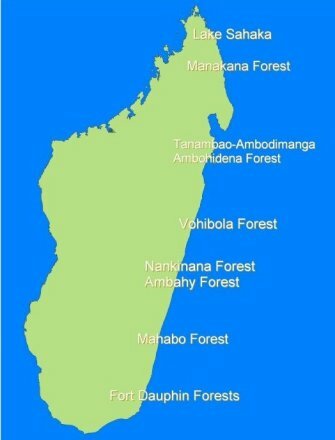 Littoral forest in eastern Madagascar occurs on sandy soil close to the coastline, while forest further inland is more commonly characterized by laterite soils. 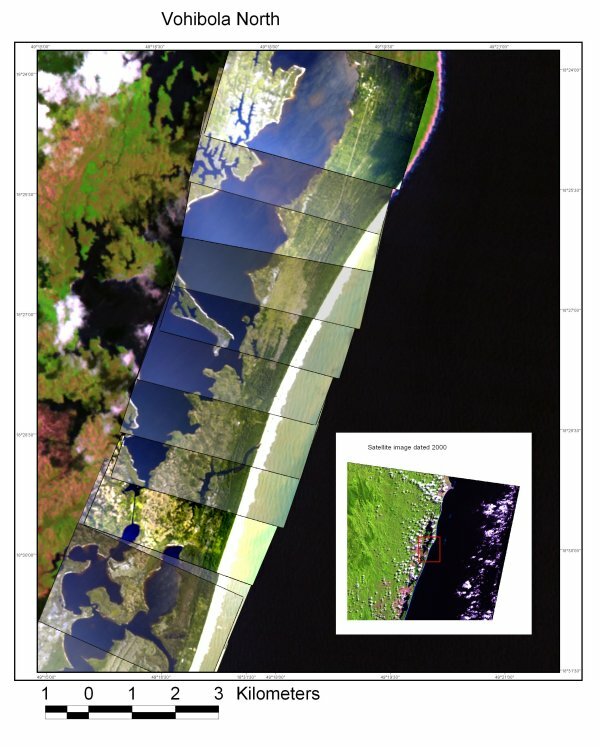 ArcView Image Analyst was used to import, view, and analyze all Landsat and aerial photographs. 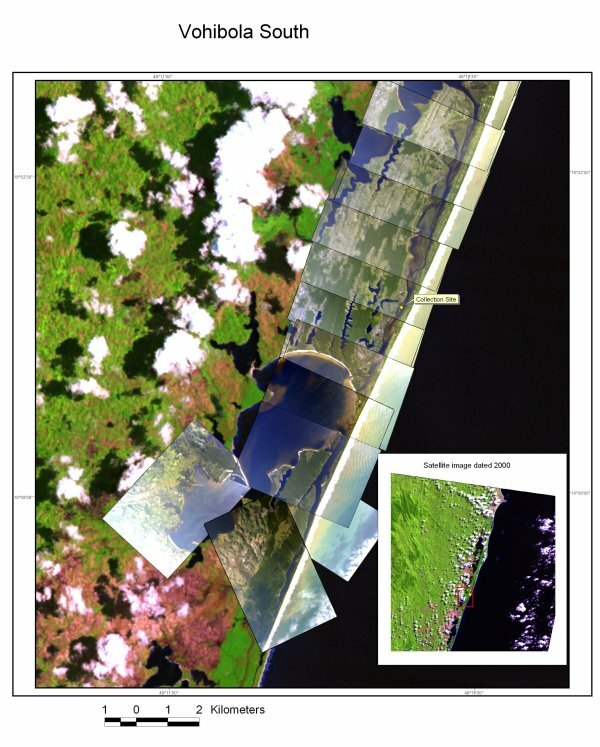 Image bands 5, 4, and 3 were assigned red, green, and blue respectively. 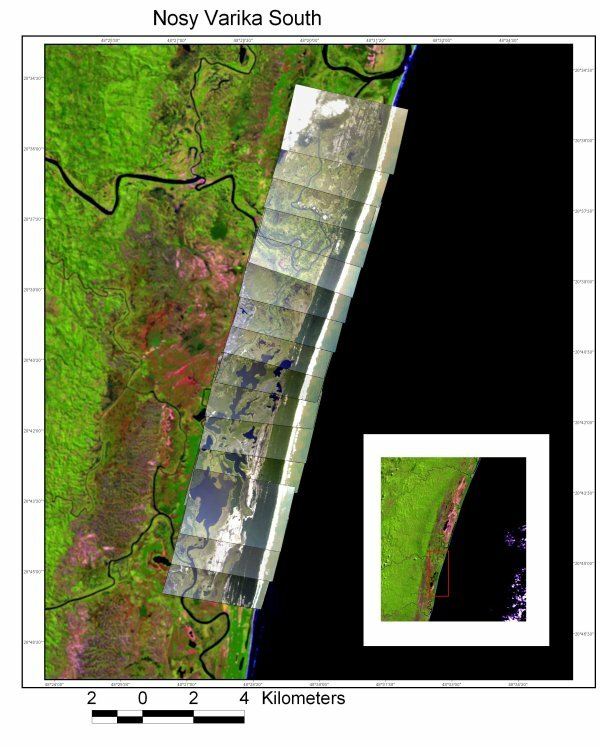 Using our techniques and the 30 m resolution of the Landsat images, it was not possible to distinguish primary from secondary forest. Images were compared to known littoral sites on Du Puy and Moat’s (1996) map of estimated primary vegetation in Madagascar, along with ground truth data and field knowledge of areas recently visited by two of the authors. 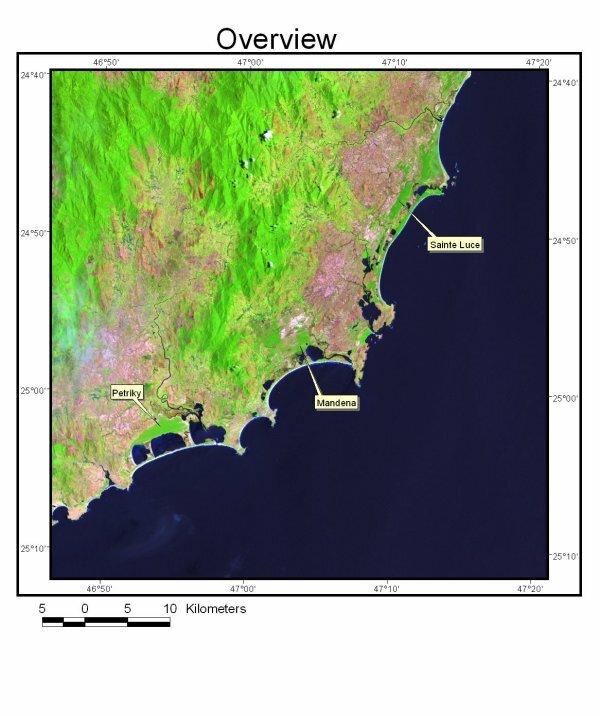 The characteristics of these areas were then used to identify other spectrally similar areas, resulting in six sites of priority for aerial photography and fieldwork. 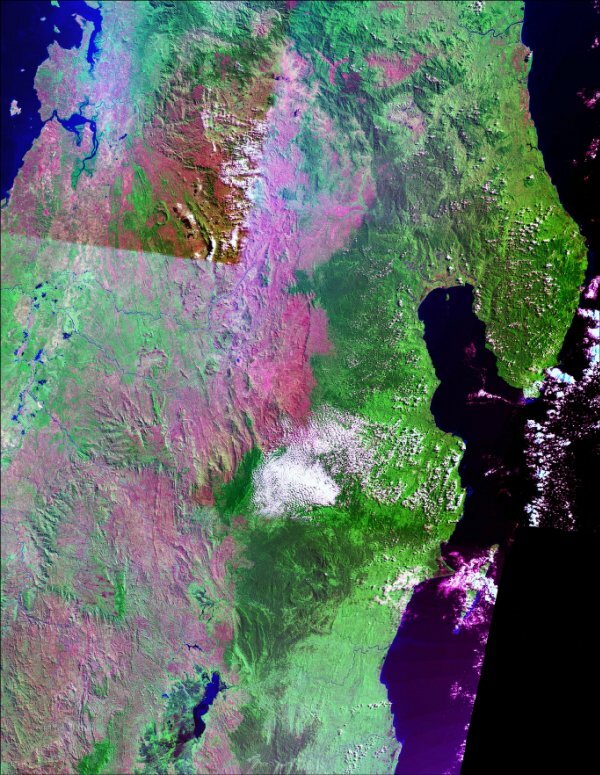 Aerial photographs for the eastern coast of Madagascar were obtained during May 2003 using a Nikon D1x digital camera attached to the belly of a low flying Cessna aircraft. 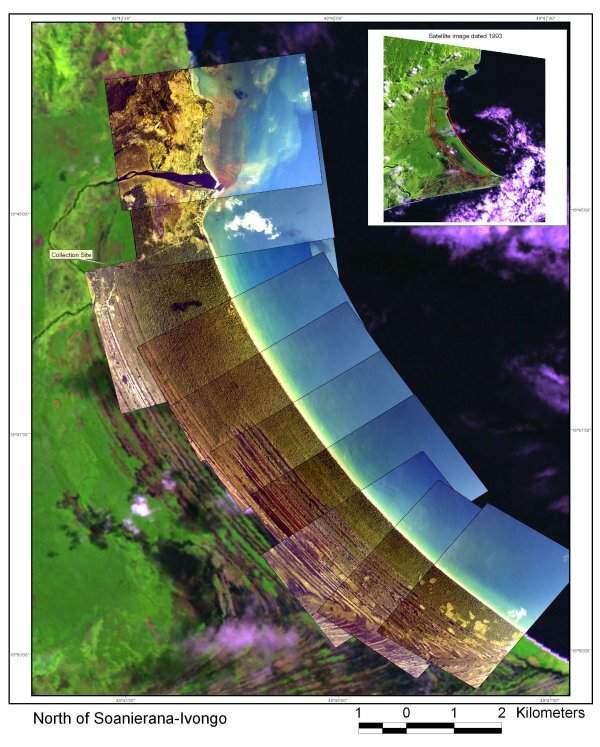 In order to capture latitude/longitude data for each image, a Magellan GPS unit was attached to the Nikon camera, which was in turn attached to a laptop, and images were taken via remote control using Nikon Capture 2 software. 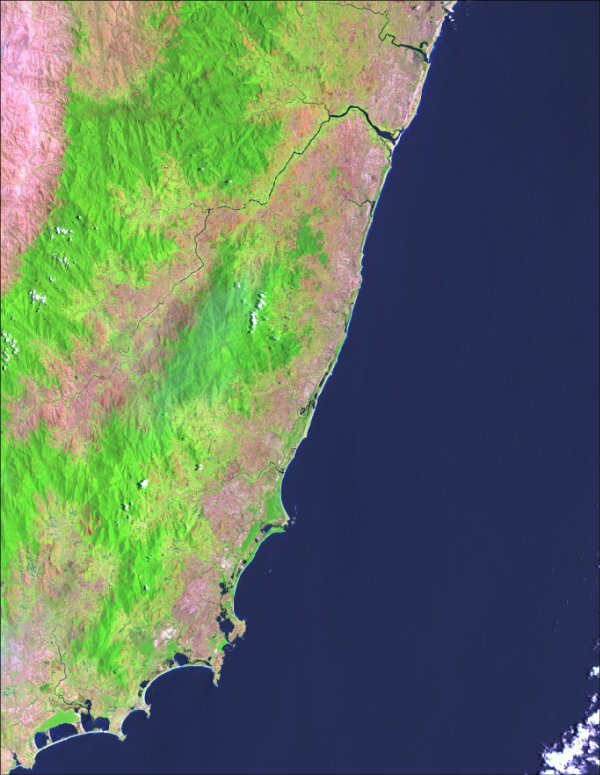 The data captured with each image included a latitude and longitude at the center of the photo. Latitude and longitude control points for the upper left and lower right of each image were estimated using the length and height in kilometers for that image. 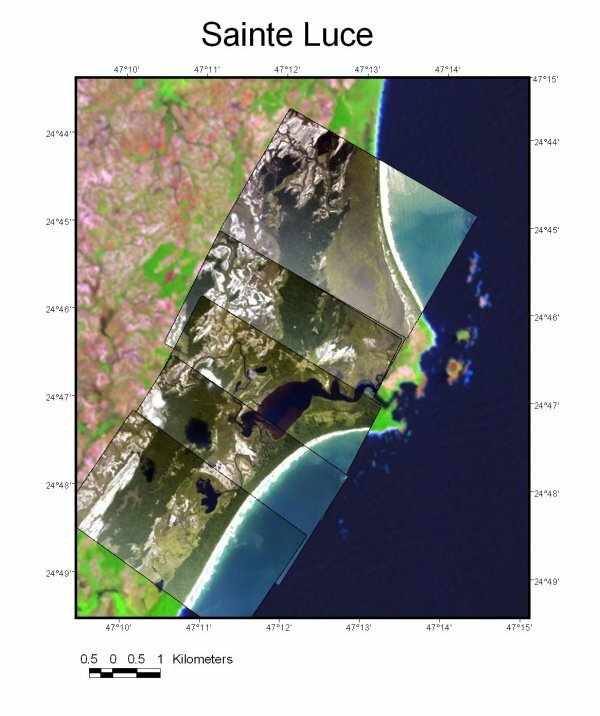 The resulting three control points and the more recent Landsat images were then used to geo-rectify the aerial photos using ArcView Image Analyst. 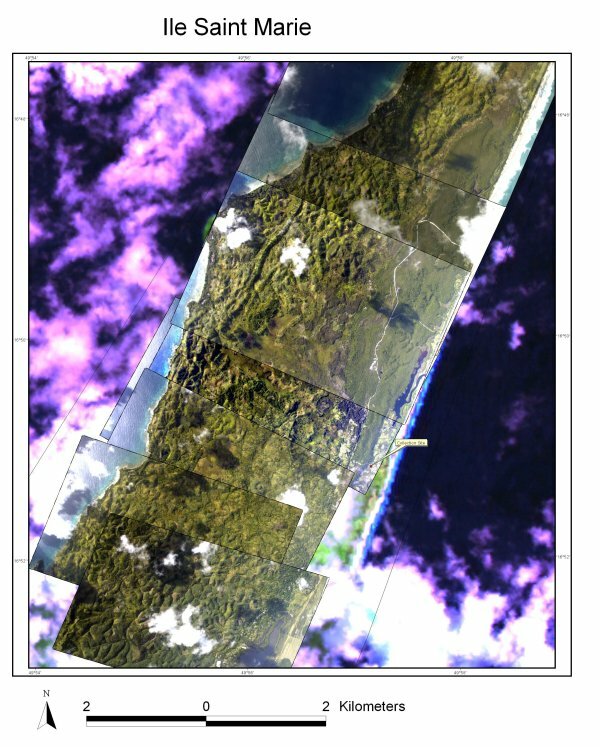 Area for each image was calculated in hectares using the Image Analyst seed tool to create polygons for all forested areas. 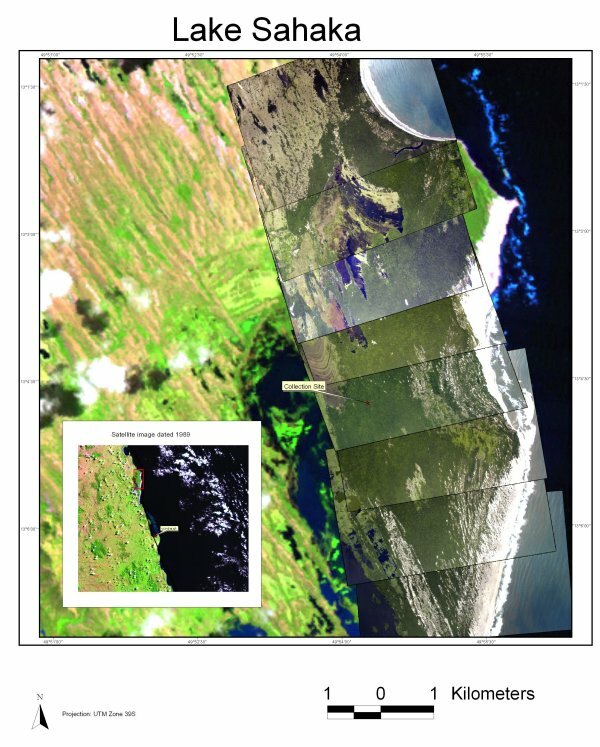 Based on the preliminary Landsat analyses we selected seven priority sites to investigate using our aerial photographs. 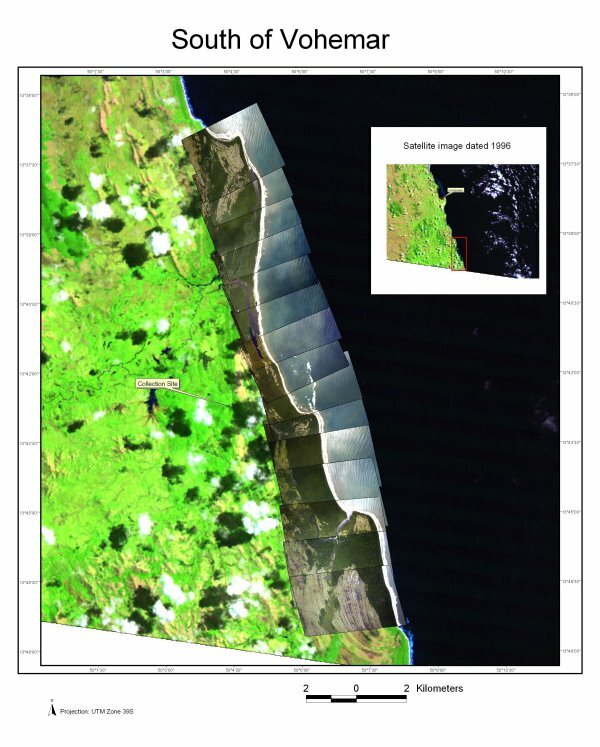 Finally, ortho-rectified Landsat TM images were used to estimate the extent of forest prior to 1995 for each of the seven sites selected in this study. Landsat images were chosen on the basis of the lowest percent of cloud cover and then oldest date possible between the years 1989 -1994. 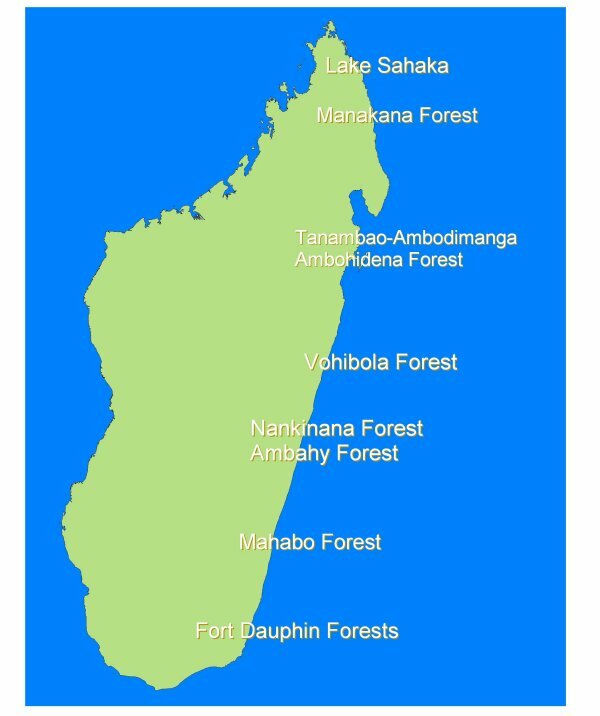 A total of 9 images dated 1989-1994 were used to classify areas within 5 km of the eastern coastline into forest and non-forest categories and forested area calculated in hectares. 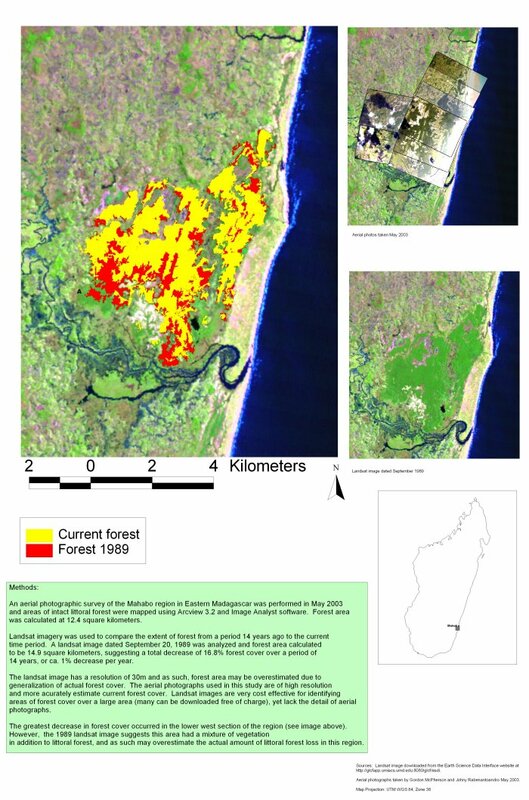 Change in forest cover for each of the seven sites in our study was then determined by comparing the area of forest present in these images to those of the recent aerial photographs.